After the avalanche that hit a hotel in central Italy in mid-January, a plethora of stories on the endless and brave work of rescuers dominated the media. Italians held their breath during the rescue operation in a race with time. The names, the faces, and the stories of those trapped in the hotel were soon read and shared by the whole country. But it was not until four days later that it emerged that a black man who worked in the hotel as a cleaner was under the collapsed building. No one was looking for him. It was Faye Dame, a 30-year old man from Senegal who had lived and worked in Italy on a refugee status for three years. Italian media did not overlook the story. Mainstream media had his photos on their front pages and talked profusely about the refugee “with no criminal records” who was trapped under the snow. No other victim of the avalanche was given the same description. Why would they, after all? As some media unconsciously misrepresent minorities due to a poor understanding of the impact of their words on readers (lack of resources and lack of training), other media intentionally target minorities – including refugees and migrants – to please their readers. If Katie Hopkins’ column on The Sun famously incited to take the guns out, the leader of France's National Front, Marine Le Pen, was reported by la Voix du Nord proposing “to wipe out bacterial immigration”. How to balance protection of freedom of speech while countering hate speech? If the US allow freedom of speech however hateful your words are, European countries tend to have a legal approach on one side and a self-regulatory approach on the other. The question on the thin line between “what speech should be allowed” and “which speech should be not allowed” has racked the brains of many in the legal, human rights, governmental, and media fields. On 26 January in Brussels, the EU and UNAOC (United Nations Alliance of Civilisations) organised Symposium on Hate Speech against Migrants and Refugees in the Media. 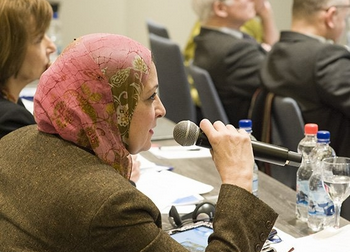 The Media Diversity Institute took part to the event with dozens of media professionals, representatives of civil society organisations, and EU officials. The goal was to find ideas and solutions to hate speech in the media, through a debate over the main challenges and an exchange of practices and points of view. Panellists agreed that there are no simple solutions to a growing level of intolerant content in the media. A holistic approach is needed, where education – media literacy – is the key. Some practical recommendations? Training toolkits, online courses, hands-on experience for students, publication of stories on the life of refugees, self-regulation in the media, target advertising (corporations should withdraw their adverts from hateful media), stick to the principles of ethical journalism, foster partnerships between journalists and civil society, and work with social media companies. With UNESCO’s Frank La Rue saying “the problem does not come from the media but journalists have lost connection with the people” and other speakers blaming politicians rather than reporters, many of the journalists present at the symposium – all media professionals with ethical standards – seemed to forget that the media coverage of refugee crisis not just repeatedly failed to correctly represent people fleeing wars, but also explicitly attacked them as “cockroaches” and “welfare parasites”. Media repeatedly make mistakes. They cannot solve the problem on their own, but they have to do their part.